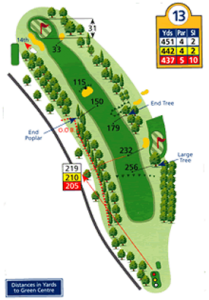 You are making the turn for home now and if the score is good you need to negotiate this tough par 4 without too much damage. With out of bounds on the left the drive needs to get over the slight rise to give most of us a long iron or rescue to the green. The low handicappers will be happy with par and most of us a bogey.